It would have been too obvious for the Emerging Civil War Series to start with Gettysburg, but now that we’re rolling along, we’ve been getting a lot of requests for it. So, it’s time to deliver. But because Gettysburg is the granddaddy of all Civil War battles and battlefields, there’s no way we could do it justice in just one book. 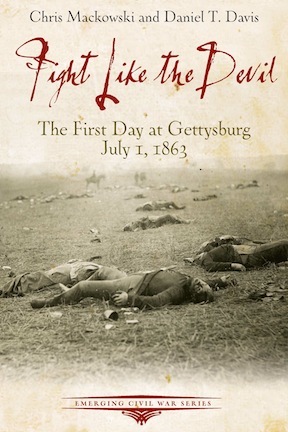 ECW is pleased to announce the first volume in what will be a mini-series of books about the most famous battle of the Civil War: Fight Like the Devil: The First Day at Gettysburg by Chris Mackowski and Daniel T. Davis. The book also features a foreword by noted regimental historian Mark H. Dunkelman. “What a privilege it has been to work on this project,” says Dan, who first visited Gettysburg at a young age with his family. Annual trips, he says, have continued through the years. Bringing decades of familiarity to the discussion—Gettysburg is the battlefield both men grew up with—historians Chris Mackowski and Daniel T. Davis, in their always-engaging style, recount the action of that first day of battle and explore the profound implications. Chris Mackowski, Ph.D., and Daniel T. Davis have worked together at Emerging Civil War since its inception. Chris is a co-founder and editor-in-chief; Dan serves as chief historian. Between them, they have authored or co-authored a dozen books on the Civil War. Chris is a professor of journalism and mass communication at St. Bonaventure University in Allegany, NY, and historian-in-residence at Stevenson Ridge, a historic property on the Spotsylvania battlefield. Dan has a degree in public history from Longwood University and has worked as a historian at Appomattox Court House National Historic Site. Both have worked as historians at Fredericksburg and Spotsylvania National Military Park. Read their work at www.emergingcivilwar.com. This entry was posted in Books & Authors, Emerging Civil War and tagged Chris Mackowski, Daniel T. Davis, Emerging Civil War Series, Fight Like the Devil, First Day at Gettysburg. Bookmark the permalink. As a long time student of the First Days battle, in particular the horrific fighting in and around the Herbst woodlot, I look forward to reading this new book on the subject. I am also looking forward to seeing this material. My ancestor was captured July 1, 1863 at Gettysburg.